There is a growing body of research examining e-Government policies in developing countries that is yielding new insights into the challenges of implementing services through information and communication technologies. e-Government focuses on the adoption of ICTs to deliver government services through the Internet and other emerging digital technologies. Governments worldwide continue to develop more sophisticated ways to provide the public with online service channels that have evolved from the early days of simple web pages to the recent widespread emergence of online transaction services and integrated service delivery systems. The purpose of Programme 2 (Hyderabad, 2010) is to support the ITU membership in improving access to ICT applications and services, especially in underserved and rural areas, achieving trust and confidence in the use of ICTs, the Internet and next-generation networks, promoting fair and equitable access to critical Internet resources. The activities in the broad area of ICT Applications includes promoting and implementing e-Services and e-Applications (e.g., e-Government, e-Business, e-Learning, e-Health, e-Employment, e-Environment, e-Agriculture, e-Science, etc.) in developing countries. Some related resources can be found below. This report aims to foster a better understanding on how to leverage the economic and social impacts of the use of mobile technologies and applications to enable ubiquitous governments, sustain public sector innovation and transform public service delivery. The report is a joint-product of the collaboration of International Telecommunication Union (ITU), the Organisation for Economic Co-operation and Development (OECD) and the United Nations Department of Economic and Social Affairs (UNDESA). In the area of e-Government, ITU is focused on enabling and assisting governments to communicate efficiently with citizens, businesses and among its different entities at the local, regional and national levels. To this end, ITU, through its Telecommunication Development bureau ITU-D, is developing an e-Government Implementation Toolkit for deploying e-Government services in developing countries. The Toolkit, to be developed in several modules, will examine key dimensions of the e-government environment to help decision makers identify priority areas for action, based on their level of readiness and national development strategies. This is the first module of the Toolkit on e-Government Readiness Assessment Framework. The e-Government Readiness Assessment Framework aims to determine the condition of e-government in developing countries; comparing it to the status of e-government in other economies, and identifying priority areas for further action. 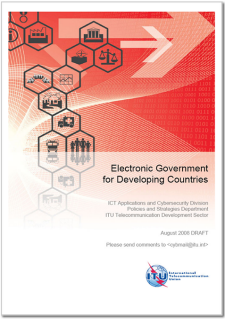 To further facilitate the assessment of national e-government readiness, the framework includes an “e-Government Readiness Quick-check Tool”, a hands-on IT-tool, developed by ITU, that assembles data from five recognized indices and a pragmatic choice of indicators discussed in this framework. 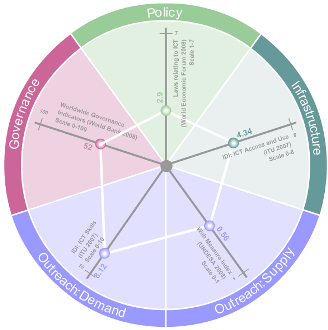 The tool provides a graphical illustration of a country’s readiness status on four dimensions of the e-government environment: Infrastructure, policy, governance and outreach. 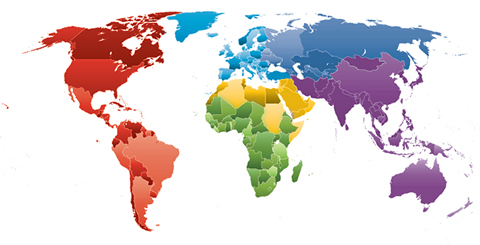 The Quick-check tool also allows users to display simultaneous graphs to compare one country’s scores to those of another, of its peer group –as defined in the World Bank’s income groups–, as well as to those of an ITU world region (Africa, the Americas, Arab States, Asia & Pacific, Europe and CIS countries). 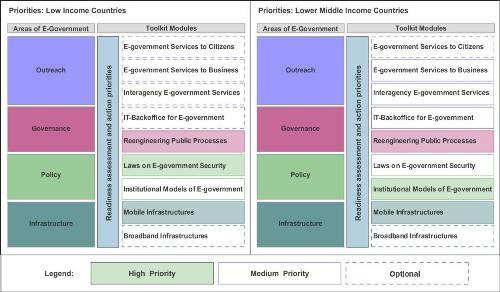 Source: ITU e-Government Implementation Toolkit, Introduction: e-Government Readiness Assessment Tool. The purpose of this report is to examine the adoption of e-Government services in countries with developing economies. The goal is to provide government leaders and policy makers with strategies on how to assist governments in developing countries to be successful in using ICTs to do the business of government in ways that genuinely support the human development needs of each and every person. E-government project in Bhutan: This project supported pilot implementation of hardware and software applications within different areas of Bhutan's Ministry of Information and Communication. This project improved the timeliness and relevance of information published on the Ministry's website and the communication flows between offices within the Ministry. Within the Development Sector, Study Group 2 (SG2) focuses on raising the awareness of decision-makers, regulators, telecommunication operators, donors and customers about the role of telecommunication and information technologies. Within SG2, Question 17-3/2 leads work on "Progress on e-government activities and identification of areas of application of e-government for the benefit of developing countries." 13- 14 May 2010 (Geneva, Switzerland): WSIS Forum 2010: Expert Group Meeting on E-Governmnet "Towards better citizen engagement for Development"
4 May 2010 (Geneva, Switzerland): Third Parliamentary Forum on Shaping the Information Society: The contribution of e-Government to countries' competitiveness and public sector efficiency.